So as not to limit the voice recognition capabilities of Barbie’s new Hello Dream House, it sends voice commands off to a private powerful server somewhere to decipher what was said, and translate the spoken words back into things the toy needs to do. It’s the same technology that makes iPhone’s Siri, the Amazon Echo, and Hello Barbie seem so intelligent—except the smart Hello Dream House doesn’t care what your favorite movie is. You’re welcome to tell it how much you loved Spotlight, but it’s really only listening to you for instructions. Lights can be turned on and color-customized by just telling the smart house which ones and what shade you prefer. Or you can say broader commands like “it’s time to get ready for school” and the lights in the bathroom will turn on in the bathroom shower, complete with sound effects of water running. The Hello Dream House has animated features as well. So instead of Barbie having to climb stairs like a peasant, kids can request the house’s functioning elevator come to which floor they need it on. 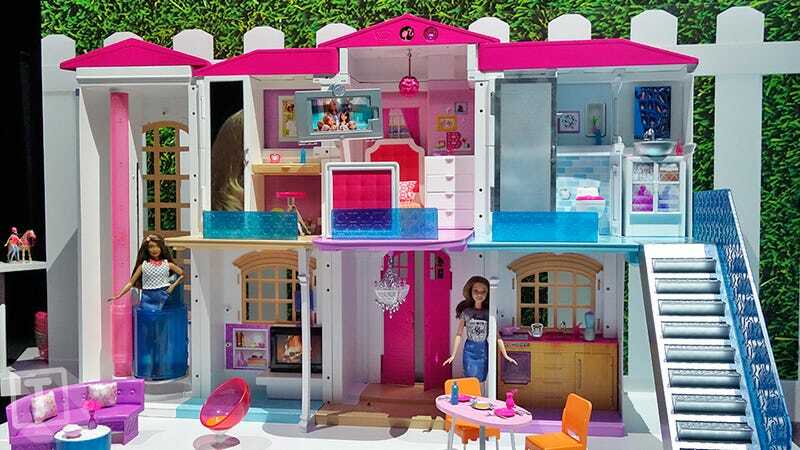 The ultimate feature in Barbie’s new Hello Dream House has to be the party mode, available upon request, that brings the entire house to life with flashing lights and music playing. The party mode even causes the house’s staircase to collapse into a slide, because that’s apparently how crazy parties get at chateau Barbie. Despite concerns over privacy which are sure to surface again once the Hello Dream House is finally available, there’s little doubt that kids are going to love the idea of a house that does exactly what they tell it to. But will parents be as keen to spend $300 on it?